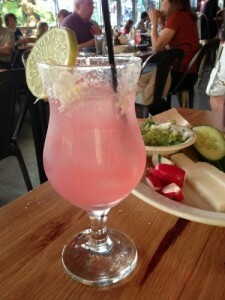 Recently I wrote about Taco Republic, a relatively new addition to the food offerings in the Kansas City area. Today, I’m writing about Port Fonda, a place that isn’t as new, a place I frequent, a place I can’t believe I haven’t written about already! What started as a beautiful food trailer (a vintage Airstream with a chef’s table inside) is now a fun and funky restaurant in KC’s Westport. If you follow me on Instagram, you’ve probably noticed I go to Port Fonda nearly every Sunday night. Sunday is like most people’s Friday to me. I work on the weekend and look forward to Monday. Sunday night is when I wrap up the week…and that usually means I have a cocktail at Port Fonda. While my favorite fella often gets their Coupe Davilla, a concoction with a ginormous square ice cube, I often try the featured margarita. 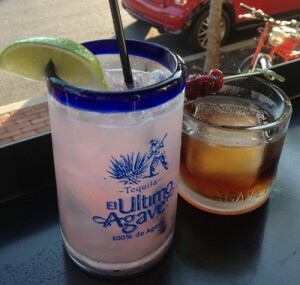 They’ve recently partnered with another of my local favorites, Little Freshie, to make margaritas flavored with simple syrups created with natural ingredients. 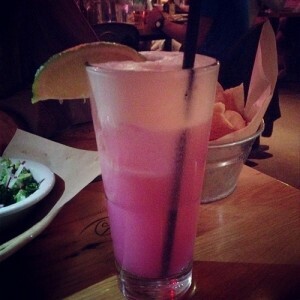 This is a Prickle Me Pink, a prickly pear cactus margarita shaken with an egg white. I love getting chips and salsa here, sometimes guacamole, too. 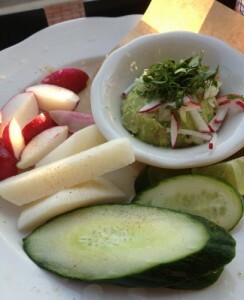 And sometimes instead of chips, I get veggies with guacamole. 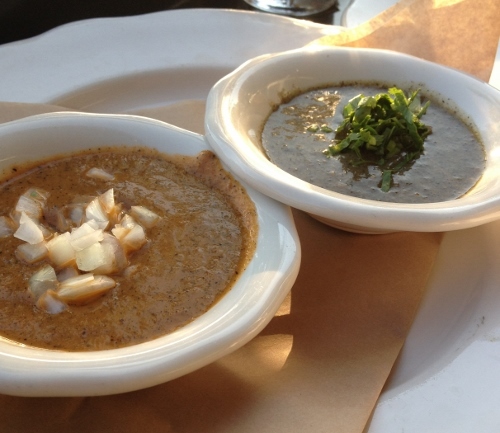 There are two housemade salsas served with chips. One has a deep smoky flavor, I’d like to buy it by the gallon. The menu changes seasonally here. 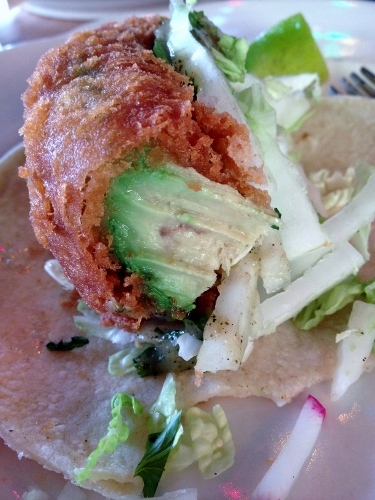 I’m hoping that soon these amazing tempura-battered avocado tacos make another appearance on the menu. These are by far my favorite taco ever. Right now, I’ve been getting the hongos (mushroom) tacos that come with huitlacoche and goat cheese. Also divine. 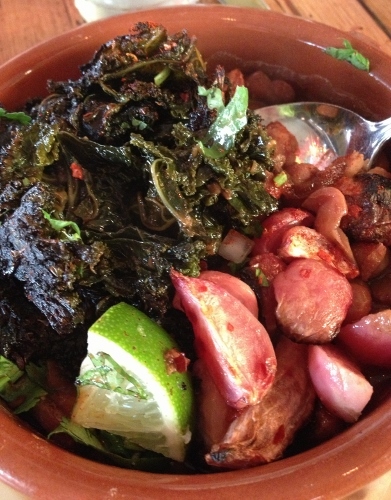 If I don’t get tacos, I get the Rancho Gordo, a small skillet with beans, seasonal greens and veggies. While not quite avocado tacos, this is one of my favorite dishes anywhere. It’s not fancy, but it’s filling and food I feel great about eating. Oh, and I often get a fried egg on top of it, an egg from a local farm with happy hens. Occasionally, I’ll have the enchilada special. It’s always excellent. Being able to eat enchiladas out as a gluten-free gal is nice, since so many use some processed sauce that has gluten in it. I’ve never had an issue with gluten at Port Fonda and servers have always been great about running to the kitchen to clarify if they are uncertain. Breaking from my Sunday routine, I ate here on a Friday recently and was excited to find the dessert of the day was gluten-free. 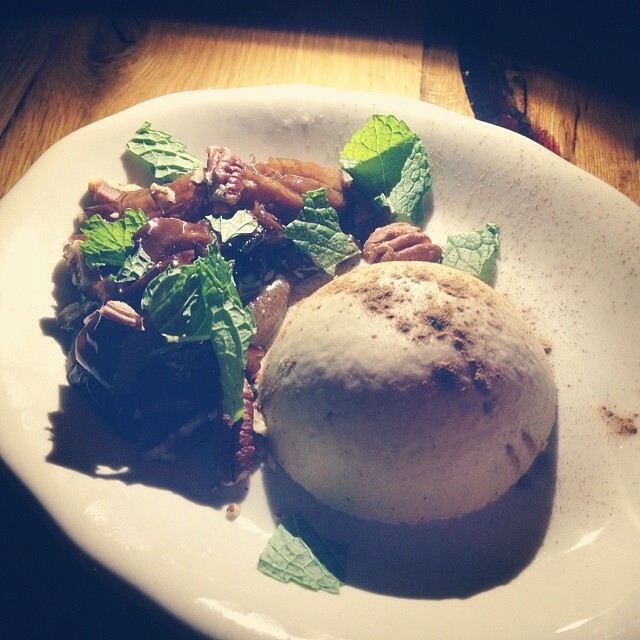 Persimmon panna cotta with pecan chantilly, caramel apples and candied pecans, simply divine! While I haven’t had that happen again, it’s a possibility. 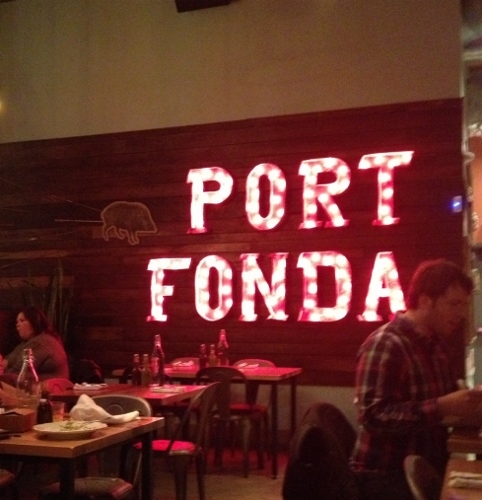 If you read reviews of Port Fonda, you’ll find one consistent gripe: the volume level of the music. If you’re looking for an intimate, romantic meal, this might not be the place. If you’re looking for the best margaritas in town and really, really good tacos, this IS the place. I like the atmosphere here, the music works for me and the food is always terrific. 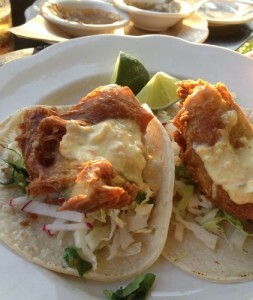 Want to read another writer’s take on Port Fonda? My friend Valerie who lives in DC and writes at city | life | eats shares about Port Fonda here. And she’s got a pic of the mushroom tacos that I don’t! Port Fonda is located at 4141 Pennsylvania Avenue, Kansas City, Missouri, 64111. 816.216.6462. There is parking along the street and parking lots within easy walking distance. Eat With: Minimal caution. I eat here often and haven’t had a single gluten concern. That said, it’s always a good idea to let your server know about your food intolerances/allergies. Can’t be too careful! « Happy 1st Birthday, All Gluten-Free Desserts!